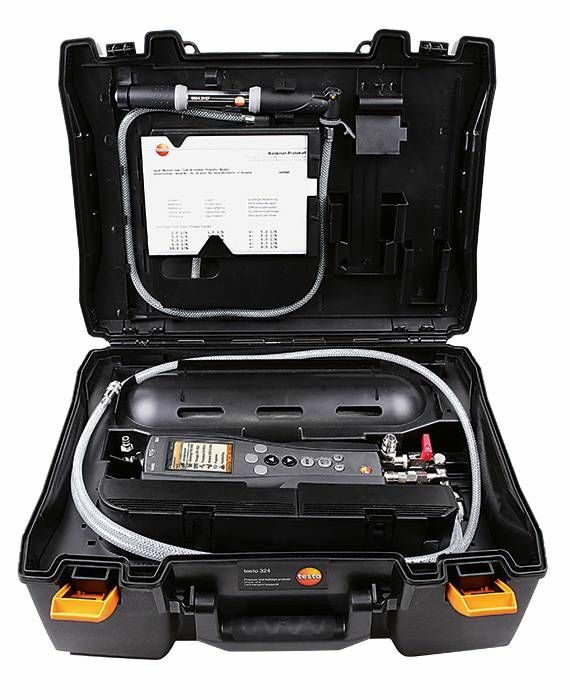 The complete package for testing water and gas pipes in compliance with directives: in addition to the testo 324 pressure and leakage measuring instrument with Bluetooth® interface, including system case with feeding unit, the set also contains a high-pressure probe, a high-pressure connection, a Y-distributor and other important accessories. Water and gas pipes can develop leaks over the years or after building alterations. The pipes have to be tested regularly and competently in order to prevent expensive water damage or dangerous gas accidents. The testo 324 gas and water set has everything you need to get started and allows you to carry out all the important tests prescribed by law with just one instrument. In addition to the testo 324 leakage measuring instrument, you also get practical accessories in the gas and water set, such as the Y-distributor for parallel measurement of two pipe sections, high-pressure probe, test stops, high-pressure stage stops, etc. Would you like to be able to document your measurement data on site? The testo fast printer or the testo BLUETOOTH®/IRDA printer with its Bluetooth® radio transmission option are also available to order and means this will not be a problem. We recommend our optional PC software EasyHeat for the convenient presentation of measurement processes and to manage your customer data. - Conical test stops ½" + ¾"
- High-pressure stage stops ⅜ + ¾", ½ + 1 ", ¾ + 1 ¼ "